The Vintage Club is an ultra-exclusive and private, golf-oriented community, nestled in a cove at the base of Eisenhower Mountain. It is considered one of the most prestigious gated country club communities in the country. Sprawling across 712 acres that span Indian Wells and Palm Desert, The Vintage includes 509 planned luxury homes boasting magnificent views, and stunning lande replete with waterfalls, lakes and palm lined avenues. A magnificent 85,000 sf clubhouse serves as a focal point set amid five lakes, and the Club’s two 18-hole championship, award winning, golf courses. The golf courses encompass 400 acres at The Vintage and were designed by Tom Fazio, one of the game’s most highly regarded golf course designers. Fairways were planned to capitalize on the rugged beauty of the surrounding mountains, while blending harmoniously with the native desert environment. In addition to the world class golf offered at The Vintage, there is also a 15,000 sf state-of -the-art Fitness & Wellness Center, with an elaborate Swim Complex for the active and fit. There are eleven tennis courts at The Vintage Tennis Club complex. The complex features a lavishly appointed, sunken stadium court, with seating for 1,000 spectators. For night play, there are three lighted courts and many other additional recreational amenities. The Snack Bar is available to members as a casual alternative to clubhouse dining in a relaxing outdoor setting. The Vintage is appealingly situated a mile from El Paseo, Palm Desert’s very own “Rodeo Drive”, where the finest dining, shopping and entertainment available in the valley can be found. Interstate 10 is a mere 20 minute drive away, making travel to Los Angeles, San Diego, etc. conveniently accessible. Some of the world’s most talented designers and consultants were tapped to create the timeless style of architecture that defines The Vintage Club. Both traditional and contemporary styles are seamlessly married, to create the elegant and superbly built homes within the Club. Members can select the perfect living environment to suit their needs. Choose between the five unique product types ranging from 2,000 sf. 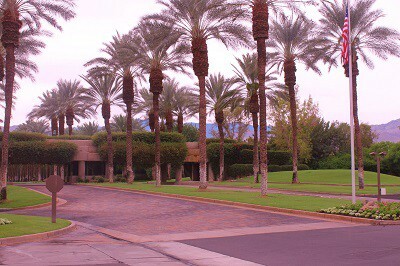 There are charming cottages, terrace condos, patio homes, desert homes, and spectacular custom estate homes.